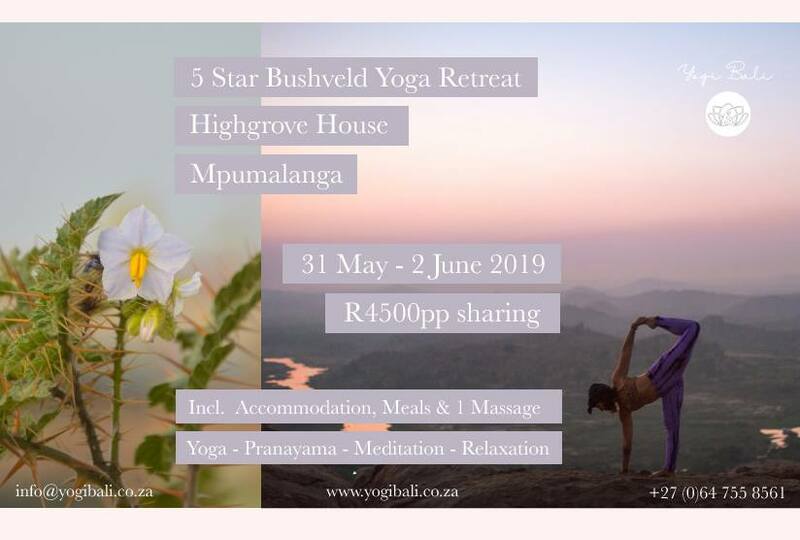 Join Yogi Bali as they host their first Yoga & Breathwork Retreat within the heart of the Bushveld - Mpumalanga, South Africa. Chloe & Ryan will be your guides for this breath-taking experience, with 5 star treatment at the one-and-only Highgrove House Country Hotel. This is a weekend experience of complete and total relaxation, immersing yourself in what Mother Nature truly has to offer you. Compliment the surroundings with twice daily practices of either yoga asana, meditation, and pranayama, led by Chloe Russell, as well as a Breathwork Workshop led by Ryan Russell. Feel free to take the retreat at your own pace, exploring the avocado and macadamia farm of Highgrove House, hiking through the forest trail, a game drive in the Kruger National Park, or indulge in the spa facilities where you'll have full access. Highgrove House is a tranquil haven in which to relax and unwind from the stresses of everyday life. By the end of the retreat, we hope to have you feeling fulfilled, relaxed, and at peace, incorporating that sense of calm into your over-all wellbeing. 1x Mindful Meditation hike through the Highgrove House Avocado and Macadamia Nut farm. Cost - R4500p/p sharing. All inclusive. Transport - Transport is not included, however transport can be arranged at an extra cost. Please enquire via email. Please note, no children or animals allowed.